A full circle antique style collet set gemstone ring created and set with alternate genuine vintage/old cut Rubies and Emeralds from the early 20th century. This unique band was created to unconventional precious metal arrangements but still mimicking the “collet settings” popular during the Georgian Era. 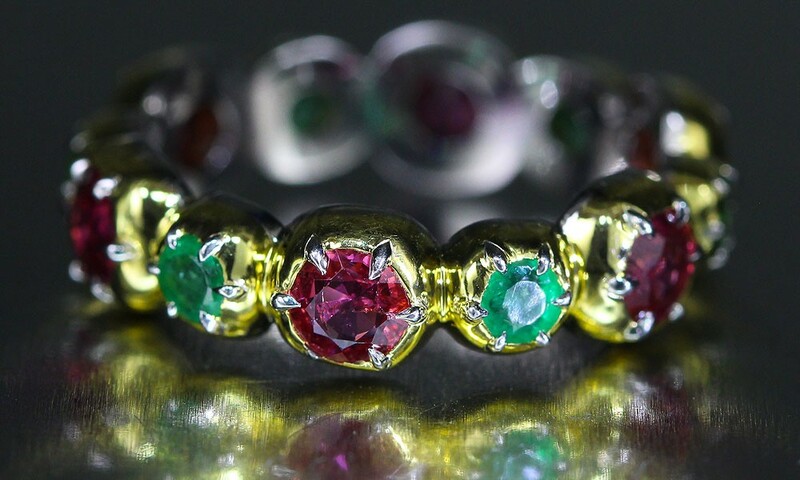 The gemstones are set in our uniquely designed 22kt gold over (topped) platinum which is contrary to the old collet setting protocol of *silver topped gold. All the gemstones are further secured with platinum eagle-claw prongs, also a unique treat for such a design. Consisting of 12 gemstones with a total weight of 2.05 carats. 6 old cut Emeralds, 0.53 carat total. 6 old cut Rubies, 1.52 carat total. 22kt gold and Platinum, 5.29 grams. *Silver-topped gold was a standard setting practice originating around the middle of the 18th century – middle of the Georgian Era – which allowed silver setting to be backed by gold, the reason for this metal combination comes from the fact that silver alone would tarnish and if in contact with fabric or skin could leave discoloration-marks and/or stains. The gold does not oxidize and therefore would leave no marks. This setting process continued to be practiced until the latter part of the 18th century when technology allowed the use of platinum for jewelry creations.